My affinity for celebrity culture began with the Chicago Bulls – circa 1995-1996. That’s right, Sports fans, the year of Michael Jordan and Scotty Pippen. The year the Chicago Bulls won 72 games, no big deal. I was eight years old. Ah, the age of innocence. Also, the age that little Allana would brag to anyone who would lend an ear, that she and her family, lived one block away from the famous, amazing, talented, wonderful, out of control, Scotty Pippen. So we were basically neighbors. Not only that, but little Allana was also born on October 23rd – THE SAME NUMBER AS MJ’S JERSEY. Crazy, right? Well, at eight years old, I sure thought so. As I grew up and Scotty Pippen eventually moved away and out of my life, my need and weird obsession to associate with celebrities sadly did not. I swooned, giggled and almost passed out cold two weeks ago when Zach Gilford, the hottie from Post-Grad, came into Quartino and spoke to me. After the five-minute conversation Gilford and I had regarding an upcoming reservation for him and his girlfriend (barf), I figured God had granted me my last celebrity encounter of the year. 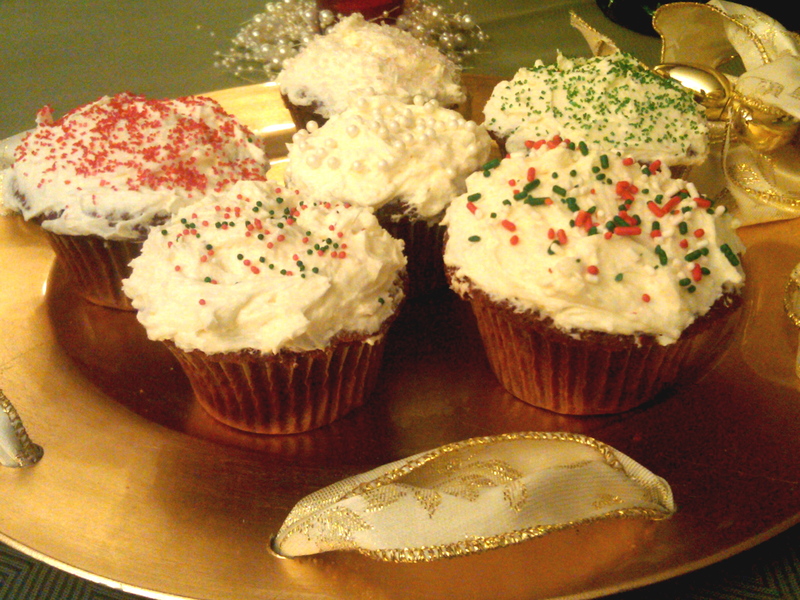 I left work today, bundled up, mentally outlining this blog post and dreaming of my last Red Velvet cupcake at home. As I walked, I returned a phone call to a dear friend, and per usual, I started to laugh obnoxiously loud. So, I’m walking, I’m talking, I’m laughing and it suddenly dawns on me that I’ve been trudging behind the same couple for about seven minutes. I realize I’m standing pretty close behind them, for who knows what reason. My sense of personal space flew out the window after I picked up my phone. I seemingly had no care in the world as I walked down Rush street, laughing and talking in a voice so loud I most likely irritated the pigeons. As I approach Hugo’s Frog Bar on Rush street, I’m continuing to walk extremely close to these two people in front of me. Either that, or they themselves had slowed down their pace, either to irritate me (not like I noticed) or to listen in on my conversation. Suddenly, I came to a standstill. My two friends start to enter the revolving doors of Hugo’s and the man and I totally make eye-contact. I study his face for two seconds, taking in his deep brown eyes, puzzled facial expression, cream hat and black peacoat until the lightbulb goes off. Michael Buble. Michael BUBLE! MICHAEL-EFFING-BUBLE. For the past ten minutes, not only had I most likely crossed boundaries with this guy, but I might’ve irritated the crap out of him. I kept walking, until I got about 500 feet away from the restaurant to exclaim to my friend over the phone what had just happened. As she told me it must’ve been him because he was recently in town for a concert, I began to beam. Maybe I didn’t annoy him at all, maybe he didn’t even notice me, maybe this is no big deal to anyone else, but to me and my eight year old self, it freaking rocked. As any foodie fan knows, Ina Garten’s latest masterpiece, “Barefoot Contessa – How Easy is That?” is now available for cookin’. I decided to pair her red velvet cupcakes with my go-to, absolute favorite and delectable frosting, Magnolia Bakery’s Creamy Vanilla. The result was heaven. Even though I’m probably five pounds heavier (I just now scarfed down another cupcake, assuming it would help me “write well”), this baking adventure was worth it. In a small bowl, sift together the flour, cocoa powder, baking powder, baking soda, and salt. Then, in a large measuring cup, combine the buttermilk, food coloring, vinegar and vanilla. In the bowl of an electric mixer (thank you kitchen-aid, for being THE BEST), fitted with the paddle attachment, beat the butter and sugar on medium speed for one minute until light. One at a time, add the eggs and beat until combined. With the mixer on low speed, add the dry ingredients and the wet ingredients, alternately in 3 different parts, beginning and ending with the dry ingredients, and mix until combined. Stir with a rubber spatula to make sure the batter is combined. Scoop the batter into muffin cups with a 2 (& 1/4) inch ice cream scoop or large spoon (I used the spoon). Bake for 25-30 minutes (25 worked great for me) until a toothpick inserted in the center comes out clean. Cool completely in the pans and frost the cupcakes with …. *Now, this recipe makes enough for a 3 layer, 9 inch cake. I cut the recipe in half and had the perfect amount for frosting the cupcakes. If you make the original, you’ll end up with more frosting than you can eat, trust me – I’ve tried. In a medium sized saucepan, whisk the flour into the milk until smooth and lump-free. Place over medium heat and while you stir constantly, cook until the mixture becomes extremely thick and begins to bubble (give it ten minutes). Take off the heat, cover with waxed paper placed directly on the surface, and let the mixture cool to room temperature, about thirty minutes. Meanwhile, in a large bowl, on medium high speed of an electric mixer, beat the butter for three minutes, until smooth. Gradually add the sugar, beating continuously for three minutes until light and fluffy. Add the vanilla, beat well. Add the cooled milk mixture and continue to beat on medium speed for five minutes, until very smooth and noticeably whiter in color. Cover with waxed paper and place in the fridge for 15 minutes exactly – get a timer. Use ASAP. 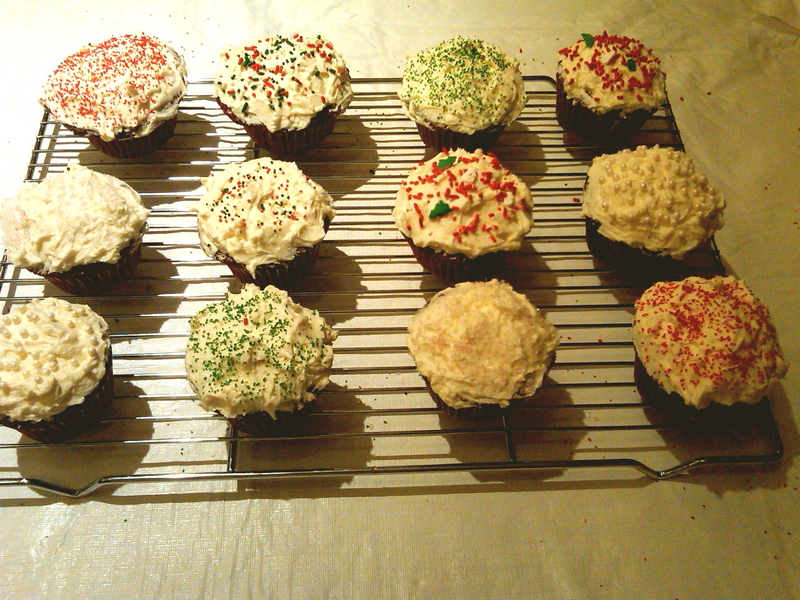 Then, the best part – decorate with sprinkles (if you like) until the cupcakes are perfection in your eyes. The silkiness of the frosting, the richness of the red velvet cake is pretty much unbeatable. The frosting melts in your mouth, leaving your taste buds screaming of vanilla and butter. In a good way, a very good way, I promise. Now, go ahead – enjoy, and please don’t eat five cupcakes in 72 hours like I did. Great site, loved your photos. You write like your full of energy, and passionate about everything you do, see, and “talk about”. Hope to see more of you on foodbuzz! Thanks, Maggie! I must say I’m quite flattered – you’re my first “real” comment, at least from someone I’ve never met! So truly, thank you! I’m glad you enjoy the blog so far, the photo’s could be better – the life of a post-college graduate can’t really afford a nice camera right now! I’m loving your blog as well, the idea of posting artwork alongside blog posts is quite fantastic, and your artwork is great! I certainly hope to see more of you as well on foodbuzz!